How do I create a new ePortfolio as a student? 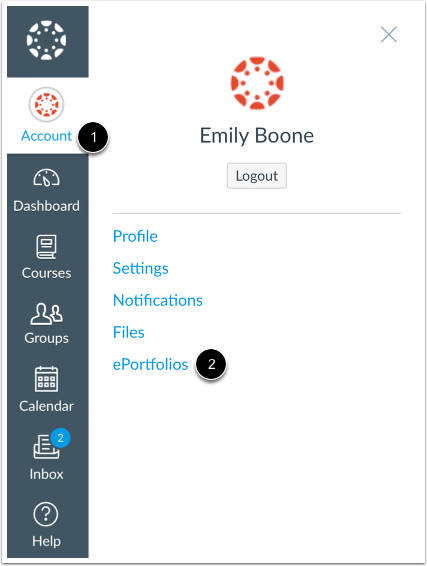 You can create a new ePortfolio in your user settings. Note: If you cannot view the ePortfolio link in your User Account, your institution has disabled this feature. Click the Create an ePortfolio button. Name your ePortfolio by typing in the ePortfolio Name field . 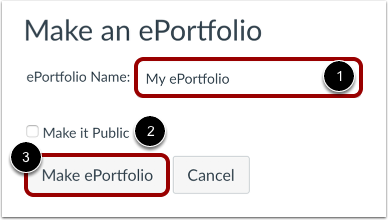 Decide if your ePortfolio will be public  (you can change this setting later) and then click on the Make ePortfolio button . Once the ePortfolio is created, there are several options for creating content for your portfolio, including a wizard that will walk you through your creation, step by step. To edit your ePortfolio settings, click the ePortfolio Settings link. Edit the ePortfolio name or visibility option in ePortfolio Settings . 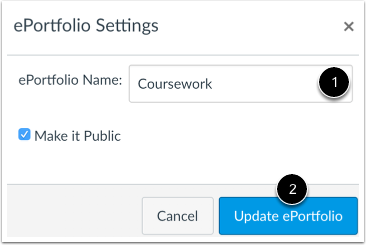 Click the Update ePortfolio button . Previous Topic:How do I use the ePortfolio Getting Started Wizard as a student? Next Topic:How do I organize my ePortfolio as a student? Table of Contents > ePortfolios > How do I create a new ePortfolio as a student? Re: What are some ways I could display collective student art for a studio art class on Canvas? Re: How can I create a sample ePortfolio in Canvas as a model for my students?